A beautiful glow highlights the rocky shoreline of Green Point in Gros Morne National Park in Newfoundland, Canada as the sky becomes illuminated in yellow hues at sunset. Gulf of St. Lawrence creates a natural sound as the waves break along the shoreline and dampen a few of the rocks. Farther up the beach where the rocky shoreline remains dry, the rocks appear in soothing colors during the sunset hours. Green Point is located approximately 12 kilometers north of Rocky Harbour in Gros Morne National Park, Newfoundland and is one of the prettiest places to watch a sunset highlight the sky in yellow and pink hues. A drive-in campground with 31 sites, provides the ideal place to set up camp and enjoy the beauty of this shoreline. Picture of a beautiful sunset highlighting the rocky shoreline of Green Point in Gros Morne National Park in Newfoundland. The sites are unserviced but toilet facilities are available along with running water which tends to make camping more enjoyable especially with children. 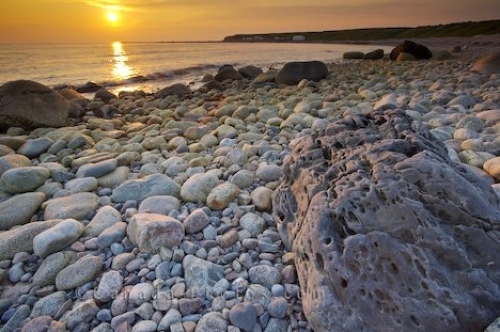 There is so much to explore while visiting Gros Morne National Park, a UNESCO World Heritage Site, and while at Green Point, the perfect end to a day is watching a spectacular sunset span across the rocky shoreline.